A business strategy is a deliberate vision to get toward a desired long-term goal. 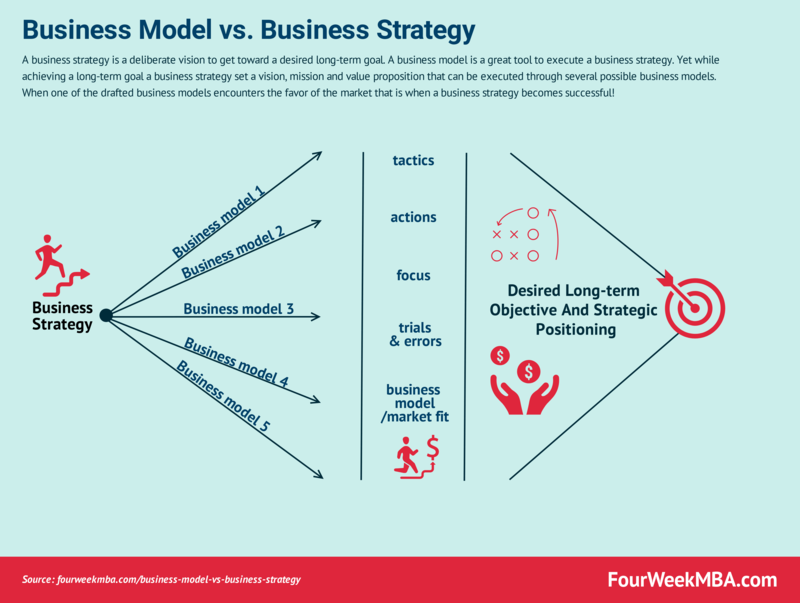 A business model is a great tool to execute a business strategy. Yet while achieving a long-term goal a business strategy set a vision, mission and value proposition that can be executed through several possible business models. When one of the drafted business models encounters the favor of the market that is when a business strategy becomes successful! For years I’ve been studying businesses with different emphasis and perspectives. When I was around seventeen, I got interested in the stock market, so I wanted to understand how companies worked. Thus, I did what it seemed most logical to me. I looked at their stock prices and how they moved over time. Analysts would call this technical analysis. While the technical analysis does have some usefulness for investing, you might use it without knowing much about the business and look at the price patterns that form over time. In the years that followed I learned how to look at other aspects of a business, from its organizational structure to its products and how the company invested its money. Later on, during my MBA I started to have a more strategic understanding of businesses by looking at the way they structured the operations, developed their product or service, and what kind of monetization they used. However, when I later worked as a financial analyst, my focus went primarily to the company’s balance sheets. I followed the money, how it moved from one account to the other and what logic is followed. I realized I could “extract” a company’s strategy by looking at their financials. There was still a piece missing though. While numbers are great to have an understanding of how the company moved and what motivated it in the short-term it was hard to have a long-term vision. Thus, I looked for other frameworks I could use, and I could integrate to have a complete theory of firms. That is where business modeling came in handy. I could look at a few key elements to have a current picture of a business. Business model theories and frameworks are primarily rooted in the digital transformation era. When companies realized the importance of the web not just as a new channel, but as a business world in its own sake. I studied several tools, theories, from the academic to the tools put together by practitioners. Integrating financial analysis with business modeling gave me a better framework to formulate and gain a better understanding of any company. That is how I moved from financial analysis to business strategy. Put shortly; a business model allows you to capture the present picture of an organization. Or it helps you design how you want a company to look like in the future. Thus, to find an analogy a business model is more like a picture or a painting. A picture in the case of a company that has an existing business model which turned out successfully in the marketplace. And more like a painting in the case of a company for which you’re designing a whole new business model. A business strategy is a way to get there. You know where you want to be, you have a mission and a vision, you crafted a unique value proposition, and a deliberate plan to get where you want to be. For that matter, a business model is a great tool to apply a business strategy. In this case, the business strategy sets up the value proposition, which is the foundation of any business model. A value proposition can change over time as it needs to adapt to the market and meet the real value for your potential customers. Thus, where a business model is the painting, the business strategy is the hand that draws that painting. Understanding a company’s framework and how it “behaved” in the marketplace has become critical. I want to remark that companies are not people. Companies are made of many moving parts. And even though I’m referring to companies as “behaving” in a certain way, I’m not conveying this is a scientific methodology. I see business strategy more as an art than a science. And it’s not even a technological issue. Progress in machine learning or artificial intelligence probably won’t do any good to business strategy. Indeed, while machine learning is pretty good in detecting pattern in the real, physical world. When it comes to the more fluid business world, things get messy. So messy indeed, that the level of noise might be higher than the actual signal. In that respect what we call instinct or gut feelings might be more suited than a machine learning tool for understanding the future. That is why I seek straightforward thinking tools to analyze the business world. It’s important not to get bogged down in too complex analyses, but be very wary of the kind of data ore metrics we use to track our business success. Where a business model is a possible way to get to a desired strategic long-term outcome. A business strategy is what sets things in motion and what keeps a long-term focus. A good business strategy – in my opinion – has to be straightforward, it has to reduce the noise, and even though a bit simplified it needs to be exhaustive and profound!